Can you believe it? When I did my little walk-through of the August solicits the other day, I got so caught up in Shadowland that I completely forgot to mention one of the comics I’m looking forward to the most. 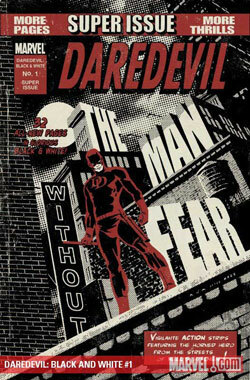 Daredevil: Black and White #1 is a one-shot that gives us three stories by three writers not set in current continuity. Have a look at the full solicit below, and we’ll talk about it. Also, have a look at the pictures Kuljit posted on ManWithoutFear.com that show how David Aja managed to whip up that gorgeous cover. Nice! Generally, it looks like we’ll be dealing with classic Daredevil themes and classic Daredevil villains. I don’t mind this one bit. Not that there can’t be too much of a good thing, but when done right, the conflicts between Daredevil, the Kingpin and Bullseye are compelling for a reason. Are you going to be picking up this issue and what story are you looking forward to the most? I’ll see you back here tomorrow when I’ll try to finish up “science week” (which turning into “science month”)! This one-shot is a really great idea. I think I am most looking forward to the gang war story set in Japan, regardless of who is writing it. I’ve always liked the “swashbuckling” stories that take DD abroad for whatever reason. Christine, I think you know I’ll be all over this. My favourite character in one of my favourite formats, bring it on. Oh, neat! This looks pretty cool and, as something that likely won’t be collected in a trade, something worth picking up. I very much enjoyed both the Dr. Strange and the Ares black-and-white one-shots that came out the last several months. I have high hopes for this issue! I wonder if we should make anything of the Parental Advisory. Is that normal or should we expect a few brutal punches and curse words?